Helen Phillips is a quirky talent with a knack for writing tales that are oddly original and breathtakingly bizarre. Adjunct Helen Phillips '07 M.F.A. Love is joyous and destructive in new experimental novel by M.F.A. graduate. Adjunct Helen Phillips '07 M.F.A. stands before a crowd of family, friends and readers gathered at BookCourt to hear her read excerpts from her first novel, And Yet They Were Happy. The shop is larger than it looks from the outside; its pale wood, country interior anachronistic amidst the big city bustle of Court Street. It is a fitting place for someone who revels in contradictions and turns them into art. Happy is a collection of interlocking micro stories held together by the apocalyptic trials of two young lovers eerily named after Phillips and her husband. The stories effortlessly synthesize science fiction, magical realism, fable, memoir, lyric essay and mystery to create something breathtakingly original. This achievement does not come as a surprise to the faculty with whom Phillips studied in Brooklyn College's acclaimed M.F.A. creative writing program. "I've always been struck by her sheer intelligence, curiosity, eagerness to learn," says Obie Award–winning Distinguished Professor of English Mac Wellman. "Her work is so carefully wrought and so carefully focused, always very alive and very human. And it is as surprising as life itself." Phillips tells the audience that Happy came, in part, from her desire to throw a party featuring the guests she most wanted to invite. In fact, the opening chapter details just that, and judging from the attendees — including luminaries like the Virgin Mary and Bob Dylan — Phillips regards space/time as a nexus rather than an obstacle. "It means a tremendous amount to me to have this book — weird, raw, personal — make its way out into the world. To have people read it and perhaps relate to it in some form. Please forgive the melodrama, but it really does reduce that central lonesomeness of being human." She reads the first chapter, entitled "flood #1." Listeners are introduced to a host of characters — dragons, singers, comedians, messiahs and other not-quite-ordinary folk — who party together merrily, none vexed by thoughts of the coming cataclysm that will most certainly consume them all. When she is done, the room erupts in applause, hoots and howls. Cell phone cameras are flashing. A long line forms. Everyone wants her to sign their copy of the book. She is a tiny but nonetheless stunning figure in the crowd: clear, intelligent eyes; her gray dress adorned with an abstract, blooming white flower. 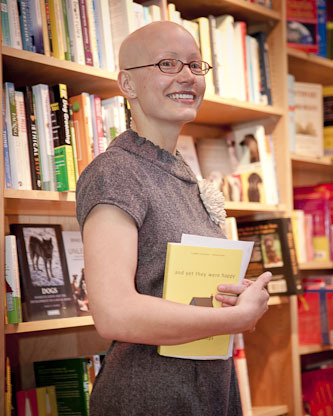 On some occasions, she wears a colorful head wrapping, but now, among the gathered, her head is uncovered (it is uncovered in the book's author photograph as well), and it is completely bald. "I lost all my hair when I was 11 years old due to an autoimmune disorder called alopecia universalis," she shares. Alopecia universalis causes a profound and rapid loss of hair on the head and body, including eyelashes and eyebrows. "I felt as though I was disfigured and would have to resign myself to a life without boyfriends or a husband, endure the stinging stares from strangers." It took a while for Phillips to understand herself as beautiful and talented in a world that narrows those definitions by the second. The support of family and friends was crucial. And she did, indeed, find love and companionship in the form of her husband, artist Adam Thompson '08 M.F.A., with whom she frequently collaborates (Thompson designed the cover for Happy and also created a YouTube trailer for it) and whose support she counts as invaluable. But ultimately, it was her grace and aplomb that saw her through. It is a testament to both her resolve and imagination that even during the most difficult moments she managed to transform her despair into something exquisite. "When I was 13, I made a New Year's resolution to read and write a poem every day — a tradition that I held up, neurotically, for eight years," she confesses. "I can't claim that I'm a poet, but I do think all those years of writing bad poems and reading great ones shaped my inner ear and developed my attentiveness to language and appreciation for distillation." Perhaps this, then, is the secret to happiness: to see the potential beauty in all things and share it with others. This approach has, at the very least, served Phillips well. And Yet They Were Happy was recently named Best First Book by The L Magazine. Phillips' children's book, Here Where the Sunbeams Are Green, will be published by Delacorte Press in 2012.